For the people of Maentsang village of Bartsham Gewog in Trashigang, walnut has now become an alternate source of income. Every household in the village owns at least a few walnut trees. And it is the harvest time right now. 58-year-old Norbu and his wife are busy picking walnuts. They own six fruit bearing walnut trees and another six, which are yet to bear fruits. “We cultivate potato, paddy, and maize too. We later started growing cardamom and walnut. The yield is good every year, so we have been focusing on it,” Norbu said. Farmers also do not have to worry about wild animals attacking their walnut trees. Walnuts have been a good source of cash income for farmers like Norbu. “I earned about Nu 27,000 last year. I am expecting to earn Nu 30,000 this year,” Tashi Tenzin, another farmer, said. 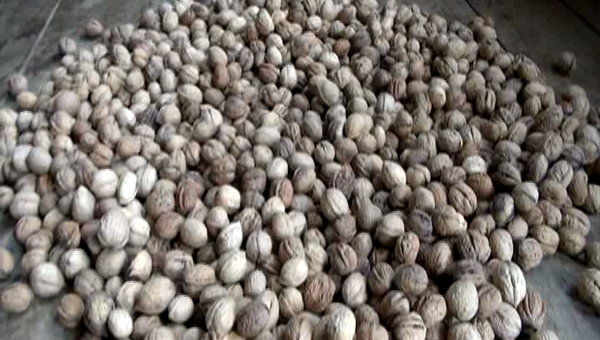 Some 80 pieces of walnuts fetch Nu 240.